Leaked renders of what is believed to be this year's upcoming iPhones have appeared on Weibo. These sources have yet to be confirmed, but what they do suggest is that the new iPhone 8's upgrades have made it into a beefier device. What appears to be renders of the iPhone 8 have been leaked by Anzhuo.cn to Chinese social media, showing the vertically-oriented dual-camera module and thin bezels that have been rumored for months now. The render shows two versions of what may be the iPhone 8: a smaller model with dimensions somewhere in between that of the 4.7-inch iPhone and the 5.5-inch Plus model (referred to in the renders as “EVT 03”) and a larger model (referred to as “602”). What stands out on the EVT 03’s dimensions is that it’s 8.6mm thick, which is significant given that the last iPhone to be thicker than that was introduced seven years ago. If these numbers are accurate, this might be a sign that Apple really has piled on a lot of powerful hardware like an on-screen fingerprint reader, facial scanners and other resource-intensive software that demand a larger battery capacity. Even with the added thickness, the camera is not flush with the rear of the iPhone 8. The renders also do not show any of the glass chassis that the smartphone is expected to feature. 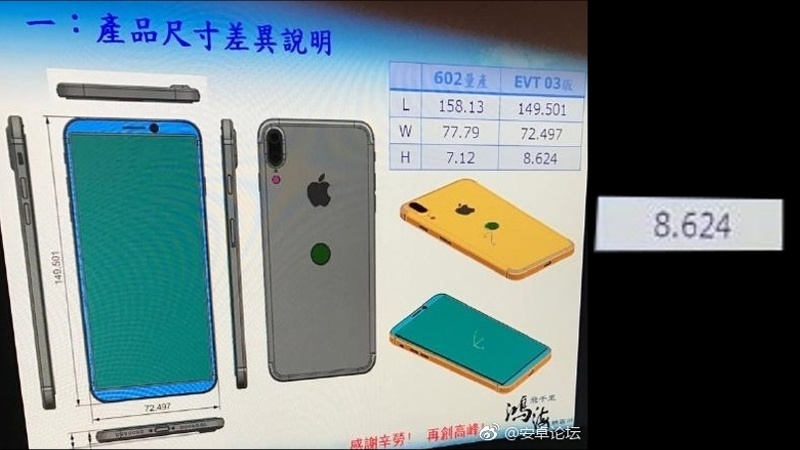 Speculators say the 602 is probably the iPhone 7S Plus, and the EVT 03 is likely the iPhone 8, and that the 8.6mm thickness likely takes into account the added width of the dual-camera module.